Do Wedding Ceremonies and Religious Beliefs Matter to God? 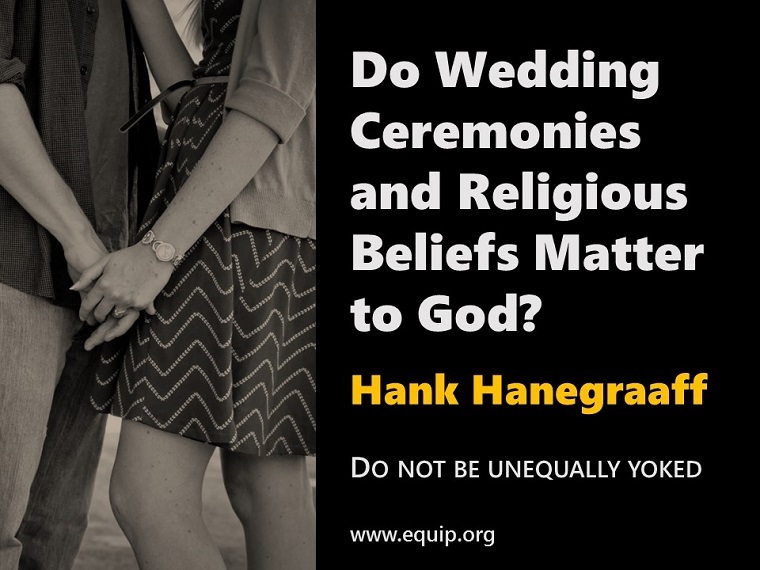 Equip Blog Home / Apologetics / Do Wedding Ceremonies and Religious Beliefs Matter to God? Q: I never came across anything in the Bible that says to be married in a church by a pastor. I was wondering are you able to marry spiritually in God’s eyes? Q: My fiancé is a Jehovah’s Witness and I’m a Christian. What does the Bible say about mixing religions? “Do not be unequally yoked” (2 Cor. 6:14, ESV). This is unequivocal, clear, and direct. A Jehovah’s Witness has a completely different Jesus. The Jesus of Christianity is the one who spoke and the universe leaped into existence. The Jesus of the Jehovah’s Witnesses is the archangel Michael, who was during his earthly sojourn merely human, and after his death recreated as an immaterial spirit creature. The Jesus of the Jehovah’s Witnesses is neither the Jesus of the Bible nor is their plan of salvation a biblical plan of salvation—it’s about what you do as opposed to what Jesus Christ has done for you. Jesus Christ, according to the Jehovah’s Witnesses, is not even the creator of all things. He was created by God and became a junior partner in the creation of all other things. Neither is the Jehovah’s Witnesses’ Bible nor their authority equivalent to the Christian Bible. The New World Translation is a perverted translation of the Bible. Christianity and the Jehovah’s Witnesses are two religious systems. One based in history and evidence and the other cultic that can never be harmonized. I can tell you right now that if you go down that road (entering into marriage with an unbeliever) you are bringing yourself a life of sorrow. This entry was posted in Lutheran Christianity, Uncategorized and tagged ceremony, Christian commitment, Christian maturity, marriage, wedding ceremony on September 2, 2016 by Pastor Jim Driskell, Lutheran Church.